This wine will be among those poured at our fall Open House, Friday, November 15, at 1212 42nd Avenue E., Seattle, 4 – 8 pm. Our harvest is over. It was the kind of agricultural year we’d not yet experienced, knew would come eventually and finally did. Mother Nature created of havoc. If one were superstitious, it would seem predictable. After all, the vineyard celebrated its 13th year in 2013. The first trial the Old Gal dealt us a horrific freeze in April, followed by a bud breaking storm in May and topped off with a drenching record-setting rain in September. The second test came unexpectedly. A labor shortage. 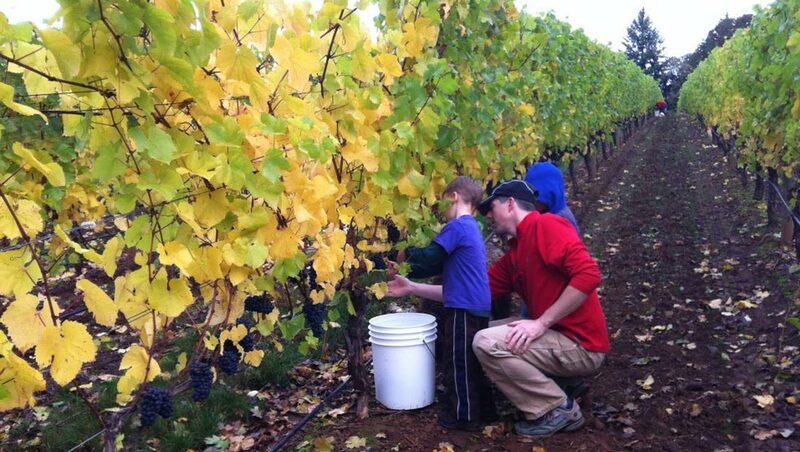 Our vineyard manager Travis had scheduled 40 pickers for the first weekend in October. They would be augmented by our family team arriving Friday evening from the Seattle area. By 8 a.m. Saturday our crew was equipped with pointed clippers, gloves, buckets and a special incentive… Uncle Toby and Grandpa’s promise of a payday, a buck a bucket. The crew was made of two six year olds, Nicholas and Walter; two eight year olds, Vernie and Will; thirteen year old Alden, 11 year old Georgia and their parents. Then the phone rang. Ned fielded the bad news-no crew available today. The fruit still needed picking. The problem solvers went to work. The whole management team from Advanced Vineyard Systems arrived with a girlfriend, a wife, children, all helping. Jeff and Toby drove to Cornelius and found seven day laborers. Anna, Scott and Ruoh-Shin hiked the rows, filling their buckets and cajoling the junior pickers. Our weekend gardener found a friend. Twenty tons came in that day. By early Sunday afternoon, our grandchildren had picked 100 buckets, each weighing 20 pounds. Ned and I know our grandchildren recognized our very real need of their labor. It was no different from our parents, their great grandparents, who drove tractor, took time off from school for harvest, milked before and after school, picked berries, sold eggs, raised beef. How lucky for them to have lived their family history. The folklore became an understandable reality. There are forecasters in our business. They announce the outcome of the current vintage with pronouncements—great or grim or in between. Since Lazy River’s first bottling in 2002 (still absolutely elegant) the combination of our spectacular vineyard site, our committed managers at Advanced Vineyard Systems and Robert Brittan’s over-the-top winemaking skill, Lazy River wines are among Oregon’s best. Oh yes, in spite of the whimsies of Goddess Nature.